My husband is so patient and kind. Not only has he been instrumental in helping me acquire and bring back to life a number of looms, he takes an active interest in my passions. He listens when I describe the projects I am contemplating, and gives thoughtful answers when I inquire as to his preferences, particularly when it involves the fabric for the duvet cover that I have planning for just over a year now. 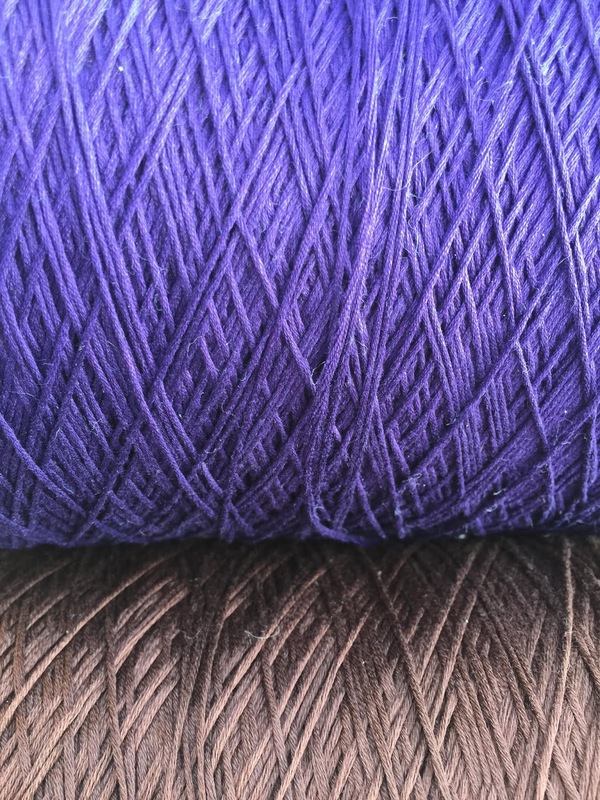 The original plan was to use 8/2 cottolin in Natural for the warp and Marine for the weft. With that plan in mind, I warped the Beast for a sampling of test tea towels in 11/2 cottolin in Natural (because I had it and wanted to preserve the 8/2 for the actual duvet fabric) with a variety of wefts, including 8/2 cottolin (both single and doubled), 5/2 mercerized cotton, 10/2 cotton, sport weight hemp, and 8/2 cotton (both single and doubled, as well). I documented the results of this experiment in the previous post. 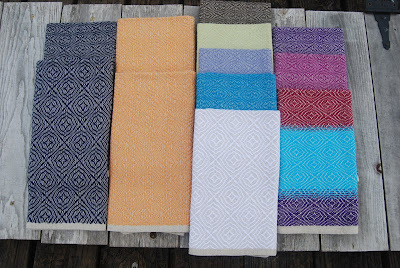 The towels on the right (orange gold) use what I am calling 5/2 cotton. I bought it from We Have Yarn on eBay. Here is a listing in another color. This thread is 1,900 yards per pound. 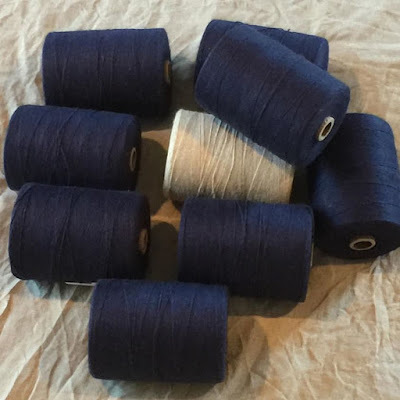 The 5/2 cotton from Webs is 2,100 yards per pound. Thus, the ebay stuff is slightly heavier. I really like it. According to the original plan, the duvet fabric would come out more like the blue towel on the upper left hand corner of that photo using a single strand of 8/2 cottolin in Marine for the weft. There is nothing wrong with the fabric, but it felt a little thin and the pattern was a lot smaller. 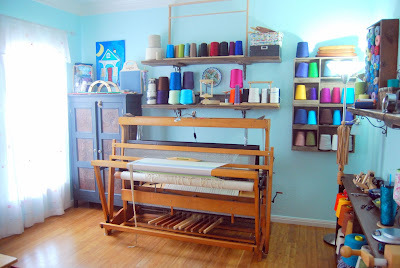 The blue towel in the bottom left hand corner of the picture uses the same 8/2 cottolin for weft, but I doubled the threads using a double bobbin shuttle. The actual weaving was a giant pain. I prefer open bottom shuttles, as I can use my fingers to control the spin of the bobbin (and the tension of the weft) as I weave. With the double bobbin, I can only control one of the two bobbins. It made for rather uneven tension, which drove me nuts. Using the double bobbin is fine for small projects; however, I have no intention of using it for large ones. However, it was well worth the effort because I so liked the results. 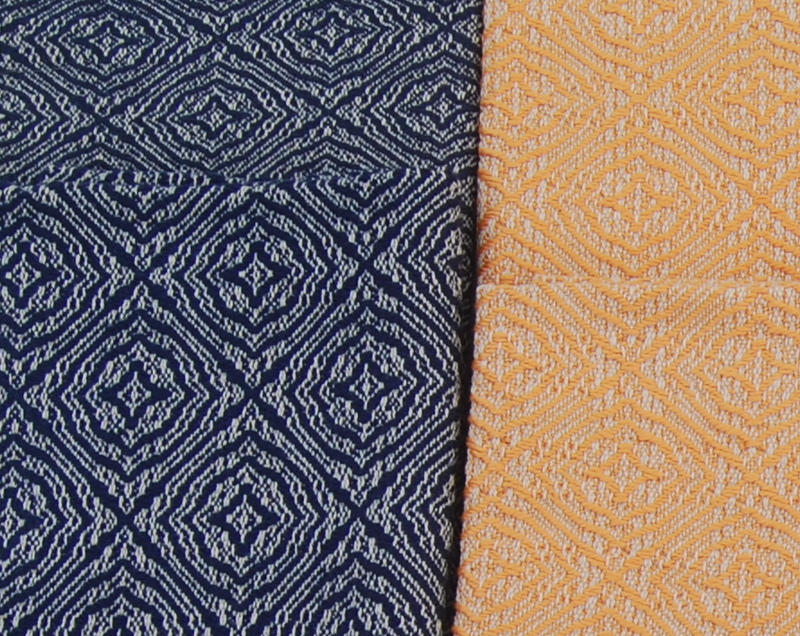 The double threads opened up the pattern and gave the fabric a nice heft and feel. 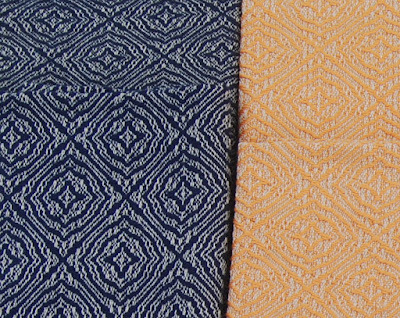 The weight and suppleness of the orange gold towel, as well as how open the pattern is, sold me. The 5/2 is slightly larger than the doubled 8/2. 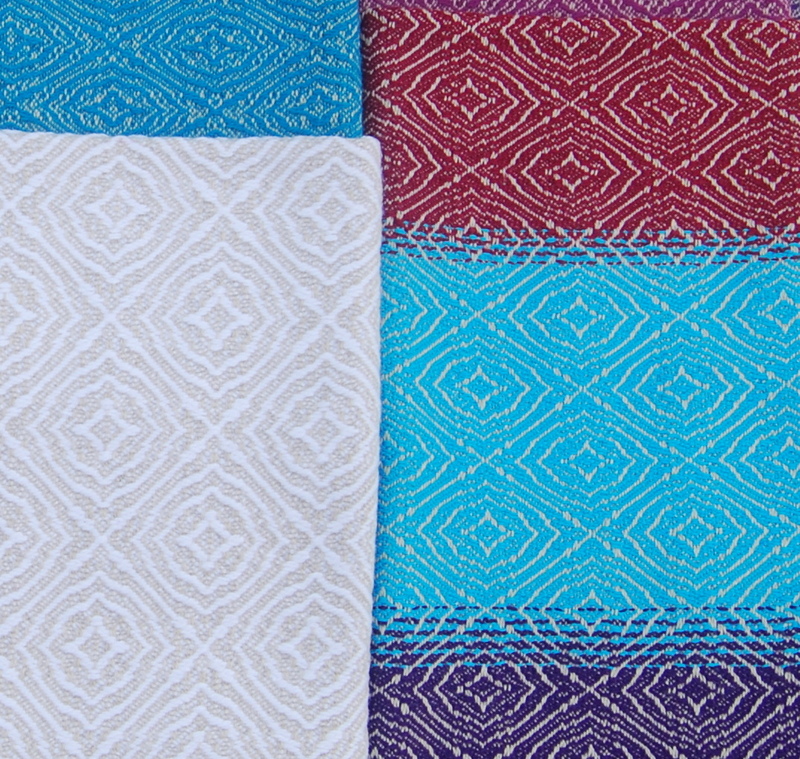 Plus, the combination of the mercerized cotton weft with the cottolin warp had the perfect feel. Now, I know there will be slight variation in the duvet fabric, as my weft will be 8/2 cottolin, instead of 11/2, but I am willing to chance it. 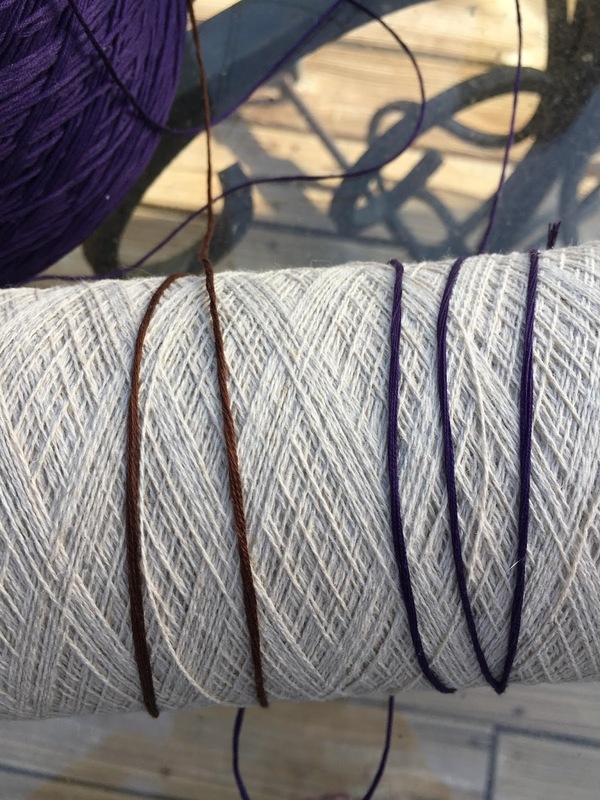 Once I decided the direction in which I wanted to go, it was a matter of finding the weft thread in the color and quantity I wanted and needed. According to my calculations, I needed 36 ounces of the 1,900 yards/pound thread for the duvet alone, not including the shams. That is 2 pounds, 4 ounces. There was a single cone in Indigo that weighed in a 2.5 pounds or 40 ounces. It was a bit more purple than blue, but I really liked it. They also had a white and a luscious brown. Brown is actually one of my favorite colors. (I know, few people have ever said that.) I ordered all three! Last night, I shared all of the above with the handsome husband. I explained how and why I moved from the original plan to the present one. He was right with me. 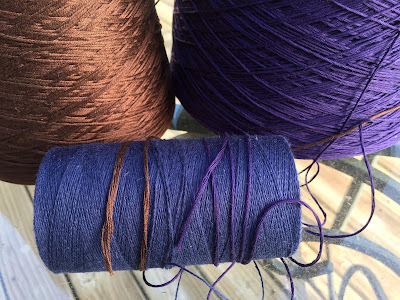 Then, I mentioned that I was somewhat concerned about having enough of the Indigo to complete the entire project, but was toying with the idea of using a Fibonacci sequence to transition from the Indigo to the Brown for the last third of the fabric. He raised an eyebrow. I showed him the purple, blue, and red towel on the right; however, I told him instead of using a six thread sequence, I would use 10 or more to complete the transition over a wider area. While skeptical, he said he trusted my judgment. Once all that was settled, I threw him a curve ball. "What do you think," I began coyly, "if I changed the warp color from Natural to the Marine?" It is fine and perfectly acceptable, right? The Indigo is a bit more subtle, but I like it, a lot! The colors are not exactly the same, but it gives a fairly good representation of what I can expect. 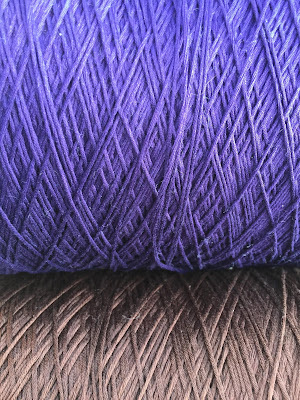 What it does not show is how shiny the 5/2 Indigo and Brown will be against the matte background of the 8/2 cottolin. We are agreed on the new plan! 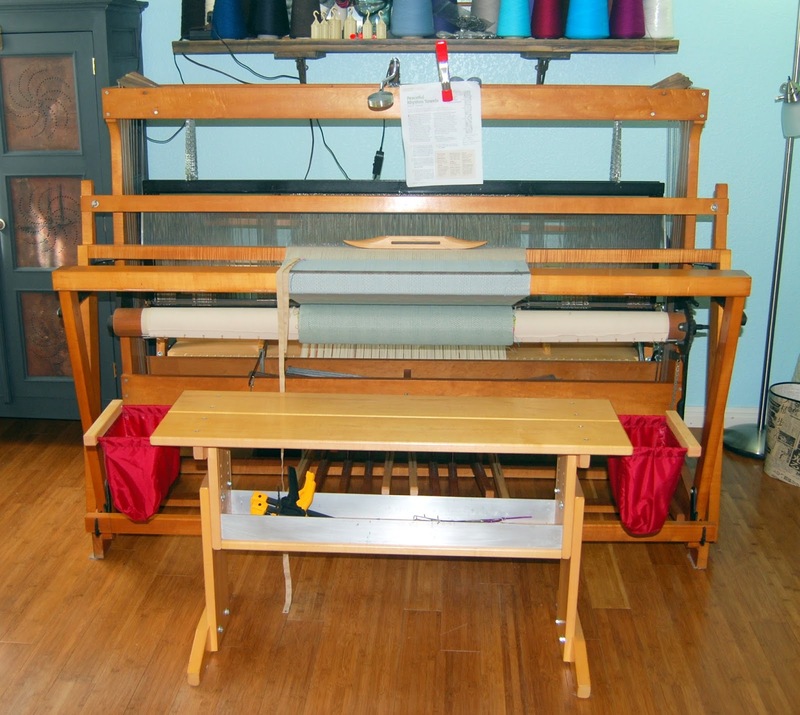 He thought he was finished with me at that point, but I reminded him that in the next few weeks I expected a shipment from Macomber Looms, which should include four new shafts and treadles to go with the lamm depressor and apron I have already received. In addition, we needed to pull off the existing harnesses and use steel to take them down to metal in order to repaint them...Then, there was the matter of switching out the ratchet and pawl system on the plain beam it came with for a drum for a friction brake and finally installing the second beam (sectional) with its own separate friction brake...to complete all the upgrades to Lil' Miss Macomber. He lifted a hand to his forehead and sighed. 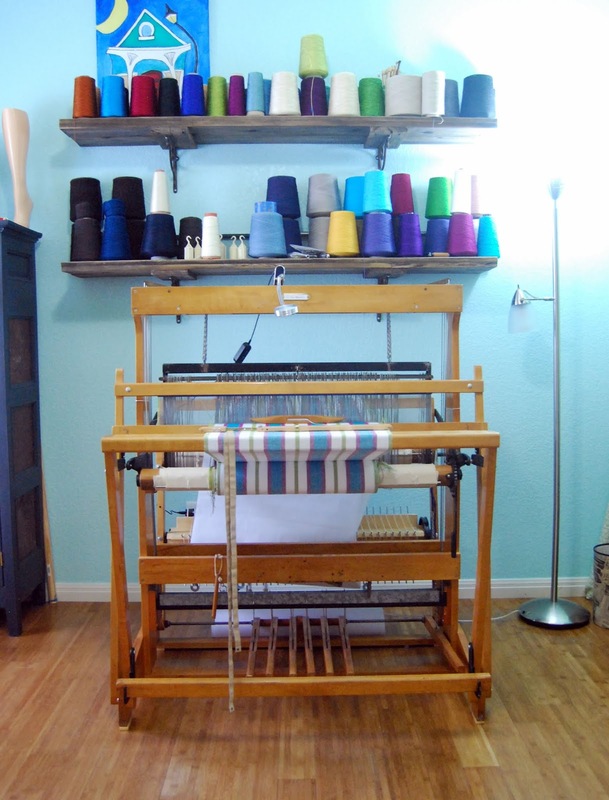 It is tough being such an excellent Loom Whisperer. That last laundry list made me laugh. Poor Brad!!! I can't wait to see how the new shades work out! And, as always, thanks for sharing your experiments and results! !